Hope is what drives the population of the small town of Cajueiro, an arid, isolated community in the southwestern corner of Piauí, Brazil. The approximately 2,000 people who live here have poor access to water and any kind of communication. There is no phone signal, internet or postal service. The biggest problem facing the village, however, is the lack of water. “I know this is directly linked to corruption,” said Cláudia (name has been changed), a young teacher at the local school. According to her, the distribution of water is political. “Normally, only those who support the administration receive water,” she says. The people from Cajueiro welcome us with their posters. 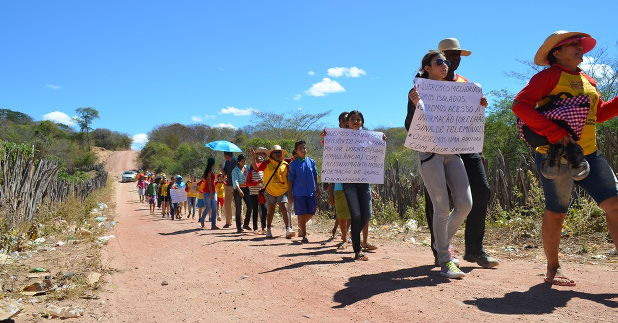 We met Cláudia on the second day of our “March Against Corruption and for Life” after our group of 25 activists walked the 30 hot kilometres to the village from Guaribas. The posters called for the village not to be forgotten: they called for access to information and a way to hold public officials to account. Water is a great concern in Cajueiro. The water trucks only come once a month and deliver 7,000 litres per family, regardless of its size. 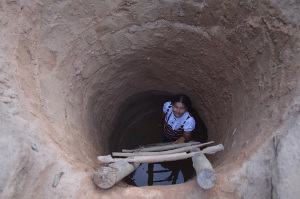 Because this is not enough, Cláudia and the other villagers have to go to the well every day to draw water and it is not always clean. “When it rains, the water goes down a creek and then we can drill a hole that is about eight metres deep. We use a ladder and climb down with a bucket,” she says. The last time it rained in Cajueiro was three months ago. Despite the drought and hard conditions the villagers stick together. “It is a close knit community. Challenges and solidarity make us stronger,” she says. Cláudia wants to become a doctor to help her village one day. At present the village gets a visit from a doctor just once a week and he or she can only see 15 patients, which means that some people either have to wait or go to another, further away, place to get help. “I want to be a doctor to serve those who need help, regardless of how many there are. If people are sick, I will work day and night,” she says. 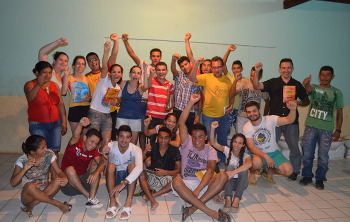 A group of young people from the village want to form an NGO to fight corruption. On the evening that we arrived in the village, the marchers organised a talk that was attended by more than 100 people who came to learn about how to advocate for their rights. Cláudia and others want to now form an association to monitor local government spending. “We want things to get better in our community. We want water, better education, infrastructure, health and sanitation. I want to fight to change the situation. I want to continue living in the village. This place is my life,” she says. 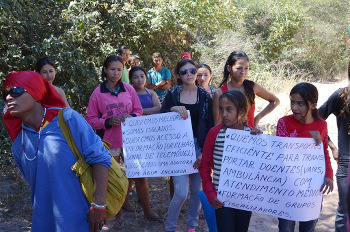 The NGOs organising the march, Amarribo Brasil, A Força Tarefa Popular and the Institute for Oversight and Control, will help the villagers form an NGO of their own and will integrate their work into that of the wider Amarribo network.